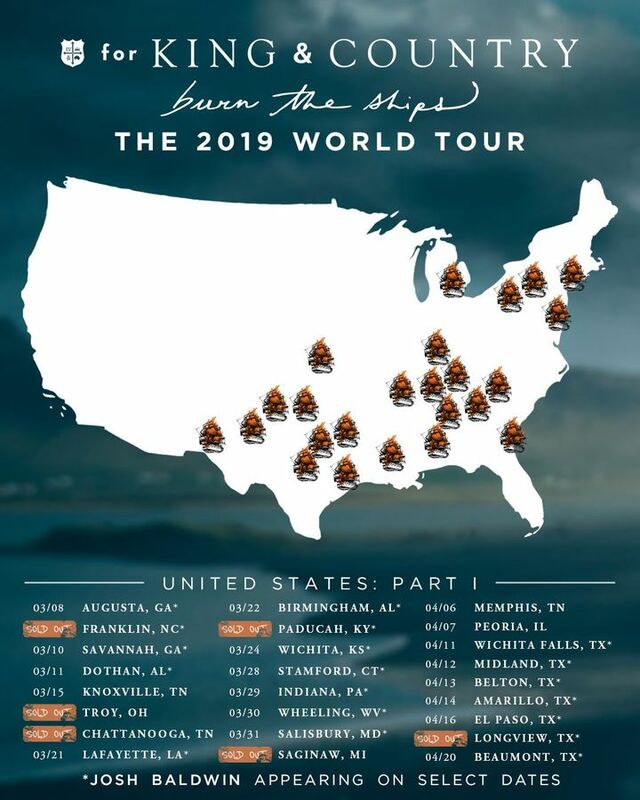 It's been a joy touring across the US these past couple weeks for 'burn the ships' tour.. and we still have many more to come! Come join us in a city near you! I had the best time at this concert. From the opening act to the main event what a truly blessed event. I met a new friend and reacquainted myself some old ones. I loved listening to this band that is so inspired by God. Their heart is for God and they inspire others to as well. Thinking about heading to a Ranger game, so I may see this band again. I took my niece to this. It was her Christmas present! I didn’t tell her until that day and she was SO excited! For King and Country is her favorite band and they did not disappoint!!! The show was worth every single penny and I will definitely be seeing them again! The venue/ parking was hassle free, and that’s a big deal for me. It was an amazing night of worship, laughing, and bonding with my teenage niece! The show was amazing! I was lucky enough to find two seats in front of each other about two weeks out from the concert for my 10 year old cousin and myself. They really are fantastic performers and are able to share their love for the Lord in such a relatable way. I definitely would love to see them in concert again! It was Awesome!!!! Best Concert and LIVE show my wife and I have ever been to period!!!! My wife and I we’re passing through the lobby after we got in for the VIP, got our merchandise and we’re headed to our seats for the Q and A and this happened!!! We saw Joel in the lobby beforehand before the Q and A!!! Yay!!!! Made our night!!! The show was absolutely amazing. Joel and Luke have this unbelievable chemistry on and off stage. Two of the most genuine guys who love what they do and know how to put on a show!... The only downside to it all is when I purchased the tickets, the seating chart was completely different than the actual setup so where we ended up being seated was not exactly what we wanted. Also, the tallest freaking guy in the whole audience ended sitting right in front of my 5'3" daughter.